Selesnya: Convoke - (this is the only returning mechanic) This mechanic allows you to tap creatures to help pay for spells. Boros: Mentor - When a creature with Mentor attacks, you put a +1/+1 counter on an attacking creature with less power. Dimir: Surveil - similar to scry but instead of putting on bottom of library, you put it into your graveyard. Golgari: Undergrowth - Undergrowth abilities care about the number of dead creatures in your graveyard. Izzet: Jump-Start - You can cast instants and sorceries with Jump-Start from your graveyard by discarding a card, paying the mana cost and exiling the Jump-started card. 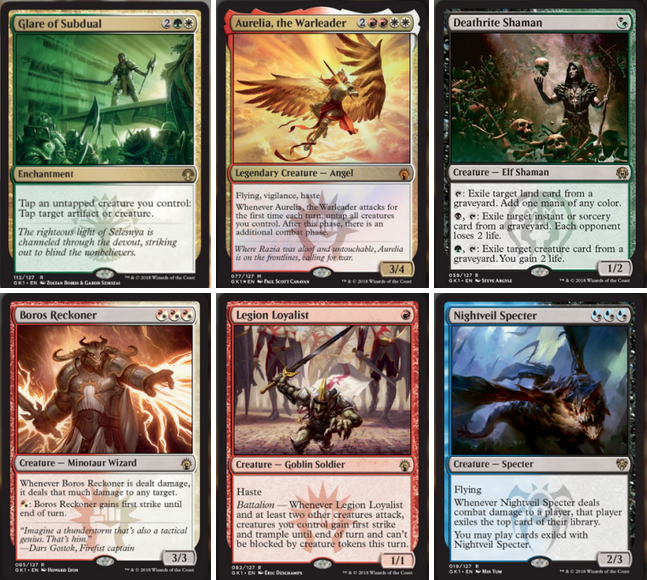 A number of card previews for the Guild Kit product was provided - yeah, and these look GREAT ! These cards are not intended to be legal standard. 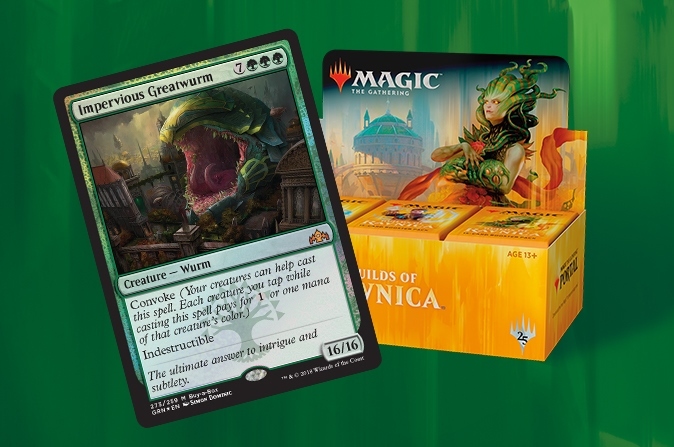 Each Guild Kit features a 60-card pre-constructed theme deck flavored after one of the featured guilds, combining cards from every Ravnica set released so far. 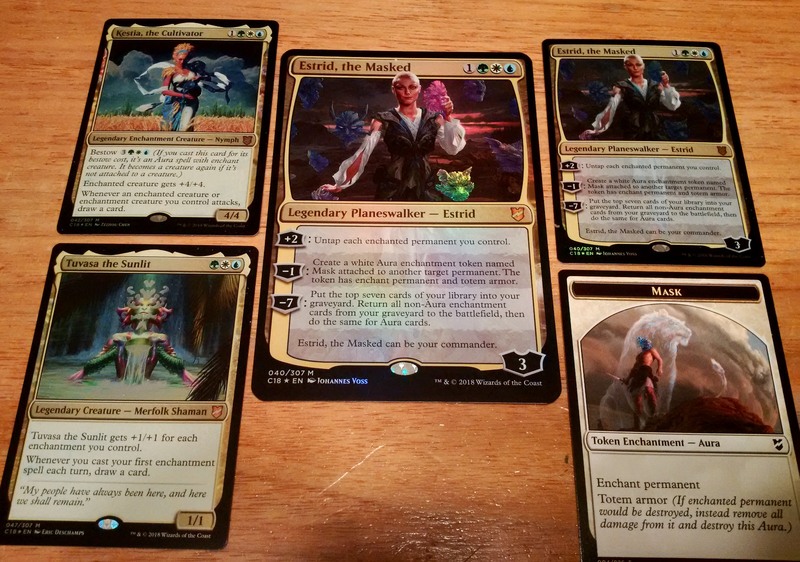 The reprints won't be Standard legal. This is an out-of-the-box introductory multiplayer Magic experience in a way similar to Planeswalker Decks. But for multiplayer. 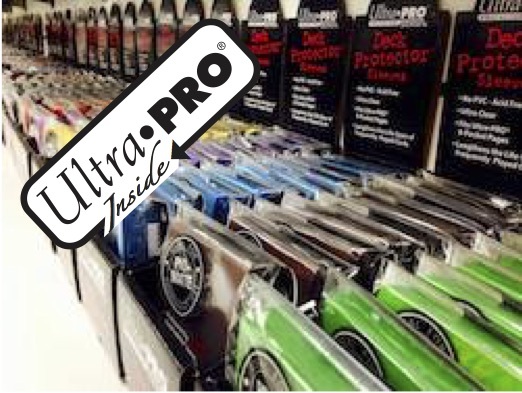 five preconstructed decks, one of each color, plus all the accessories you'll need to play the decks: spindown life counters, life counter platforms, +1/+1 counters, and five reference cards. 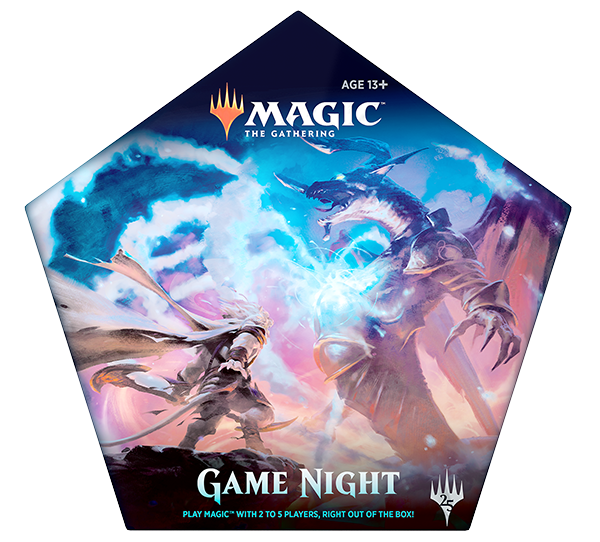 Releasing November 16, Magic Game Night will be available in local game and mass market stores around the world. The MSRP is $39.99 (applies only to the United States and Canada). Magic Game Night appears to us a decent offering to friends getting together, and perhaps not wanting to play Cards Against Humanity, Exploding Kittens, Settlers of Catan, etc., how about a Magic: the Gathering, designed for folks who may not have played before. The brilliant idea here is that everything one may need is in the same box and just sits with the rest of the games for when friends come on over for Game Night. We have a feeling that there will be two very separate groups of Magic: the Gathering fans receiving this year's 2018 Gift Pack. The first group are the casuals who will be drawn to the shiny Pokémon-like boxed sets. In addition to that, Christmas / Holiday gift shoppers in that aisle at Walmart / Target will find this an attractive purchase for their nephews / nieces / kids. The second group of MTG fans are those which have been playing and collecting for quite a while. 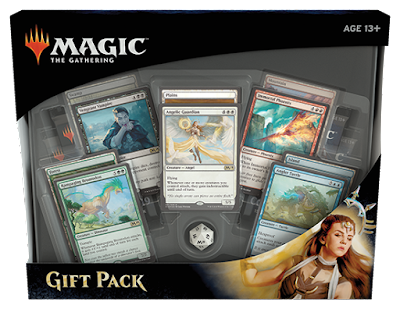 We suspect the majority of this group to issue an agonizing wail and complain that Wizards of the Coast just need to drop a bit more swag into the previous iterations of this Holiday Gift Pack where a big draw was an attractive storage box. We need more such storage boxes, so do not ask our opinion as we would be biased in our response. We had picked up the recent Magic: the Gathering preconstructed Commander 2018, 'Adaptive Enchantment'. 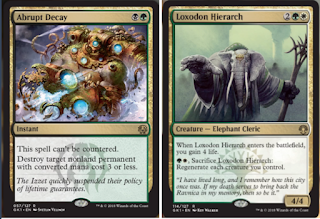 This is Bant coloured ( Green / White / Blue ) with an invested enchantment / aura theme. Although MTG and other playing cards have had a 10% tariff applied (final cost was $56.49) here in Canada, we still do not think this unreasonable in order to ensure that the local Magic: the Gathering gaming community stays intact and that there is a mortar-and-bricks location where friends can meet and play. 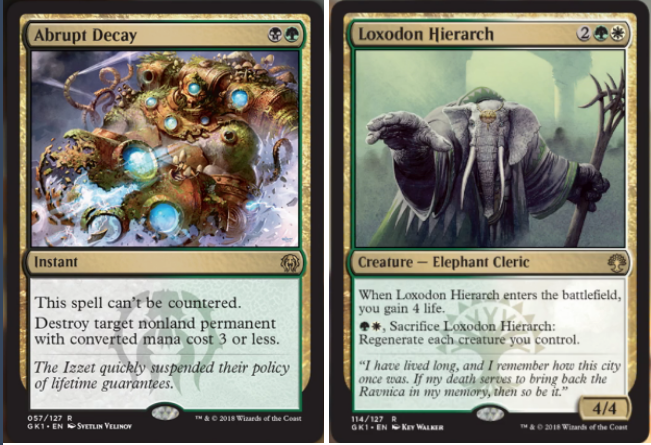 "Adaptive Enchantment" is all about playing enchantments. Your goal should be to craft a wall of magical wards while imbuing your own creatures with powerful Auras. By defending yourself with protective enchantments and attacking with huge creatures, you can defeat one opponent at a time while they struggle to defend themselves on all sides. 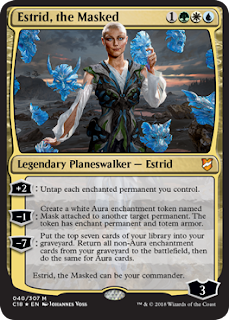 Few Planeswalkers know more about the power of enchantments than Estrid, the Masked. When playing with Estrid, you're going to want to enchant as many of your permanents as possible to take full advantage of here ability to untap enchanted permanents. No Auras in your hand? No problem. Her Mask tokens provide protective totem armor to your creatures, making them durable threats. In a pinch, you can even put Masks on your lands so that her first ability can generate mana. 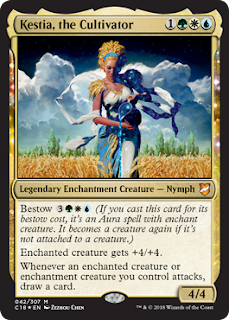 You could also try your hand at beating down with Kestia, the Cultivator. Your deck's Auras and enchantment creatures make for a potent offense, and the card flow Kestia creates can give you a bounty of options. As the first legendary creature with bestow, Kestia is particularly durable - your opponent will need more than one removal spell to slow Kestia down. Don't be afraid to be aggressive ! Between Estrid's long game and Kestia's quicker offensive style, there's Tuvasa the Sunlit. 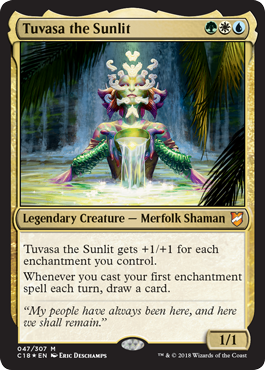 Designed to command "enchantress" decks, Tuvasa ensures you can access a steady stream of enchantments turn after turn. 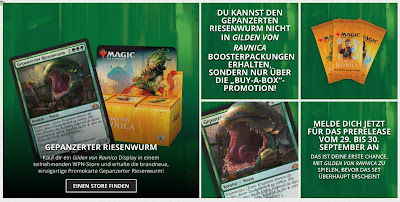 Build your board up slowly, drawing the maximum number of cards, then start pressuring opponents once your commander is big enough to threaten lethal damage. Constantly striving for self-perfection, Estrid fashions magical masks that imbue her with the strengths and skills of the creatures they represent. Calm and collected in times of danger, Estrid takes pride in her flexibility. She is always ready with the right face–and set of talents–for whatever challenge she encounters. As Estrid journeys through the Multiverse, she seeks mighty creatures with unique fighting styles and weaves their powers into new masks. The nymphs of Theros are associated with the wilds of nature–lush plains, verdant forests, and rushing waters. Kestia is a unique creation of the gods, and the cultivated fields that sustain human life are her domain. A benevolent steward of the earth's bounty, she oversees fertile fields, crop growth, and irrigation. 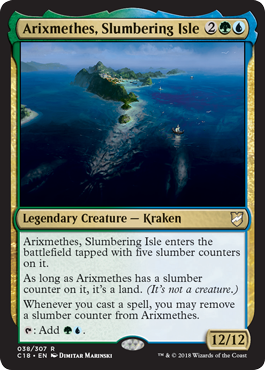 Among the River Heralds of Ixalan, most shamans feel close affinity with the winds and waters, or with the verdant growth of the jungle. Tuvasa believes the light of the sun is the power that unites them both, giving life to plants and warming coastal waters. The kraken Arixmethes is so large that he is frequently mistaken for an island. While he slumbered, an entire city was built on his back. When he awakened–as the Planeswalker Kiora battled the sea god Thassa – he wrought destruction beyond any the hapless citizens of the "island" had ever known. The end to a hot and dry summer is nearly at hand, so if you had not already attempted an overdose of long wave ultraviolet A (UVA) and short wave ultraviolet B (UVB) from that bright fiery globe in the sky, we suggest to take advantage before the restart of the academic year, return to work from summer vacation, etc. 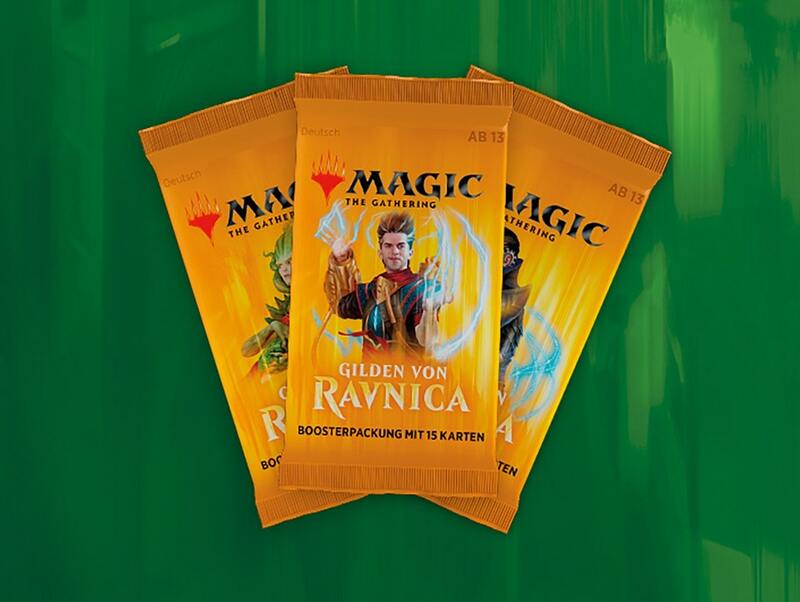 Although we do not enjoy any such short term departure from work, we acknowledge that the posts to the MTG Realm had certainly been less than 3 articles posted per week. Having stated that, we have provided for regular (almost daily) posts to our Tumblr page, linked right here. 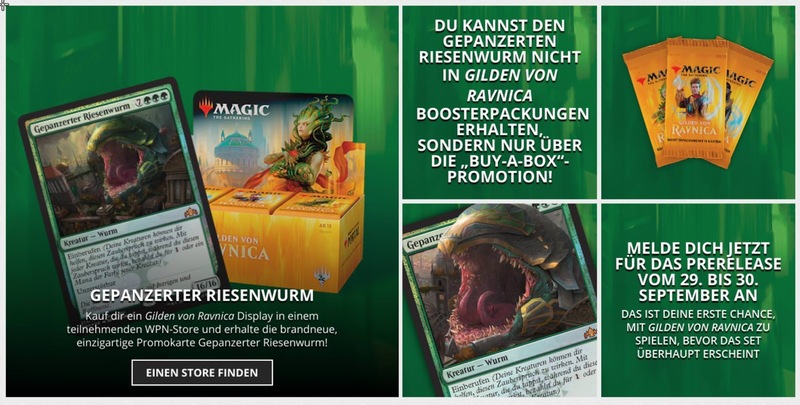 MTG Realm on Tumblr continues to deliver Magic: the Gathering related news, spoilers, and funnies to the gaming community. We are very thankful to all the 17,000 followers who have subscribed. Some upcoming dates we are looking very much forward to this fall include the September release of Creature Forge : Overwhelming Swarm MTG miniatures from WizKis as well as the October release of Guilds of Ravnica. 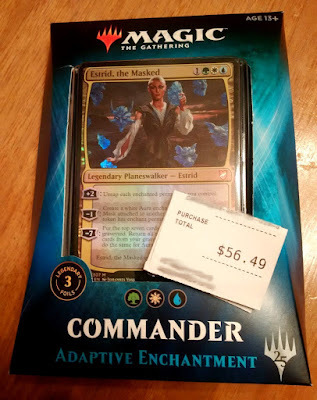 For the moment, the MTG Realm playgroup has been picking up singles from the latest Commander 2018 product offering with one member scrapping an existing Enchantress / Pillow-Fort build to meld with the Bant-coloured Adaptive Enchantments Commander pre-constructed deck. As Yasova and her granddaughters are threatened by dragons from multiple clans, they meet a mysterious Ojutai stranger. He has a story to tell about Bolas and Ugin's earliest days, a story which serves a greater purpose. Hunted by dragons, Yasova and the twins hear more of Tae Jin's tale of Bolas and Ugin and the story of their earliest conflict with humans. In a desperate attempt to assuage Atarka's anger, the hunting band plies her with the tale of an ancient war between dragons. When Yasova and the twins reach Ugin's grave at last, they find a mysterious, and potentially deadly, stranger awaiting their arrival. Nicol Bolas gives his own account of history to Naiva and makes her an offer.